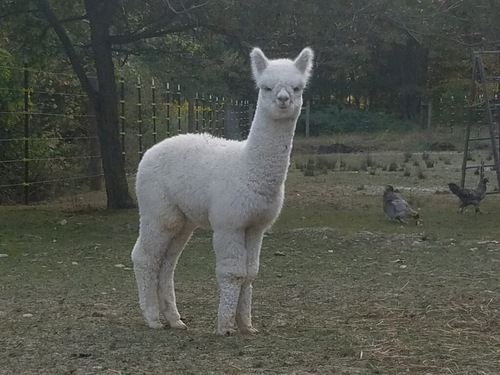 1st Zeus cria - female 2 days old-beautiful! It breaks my heart to announce that Quechua's Verticase passed away today, 11/16/2015. Give us a call – Verticase will be back in PA this spring. - I would love to schedule a breeding(s) to your dam(s). Quechua's Verticase is co owned with Golden Spirit Alpacas and West Penn Alpacas. 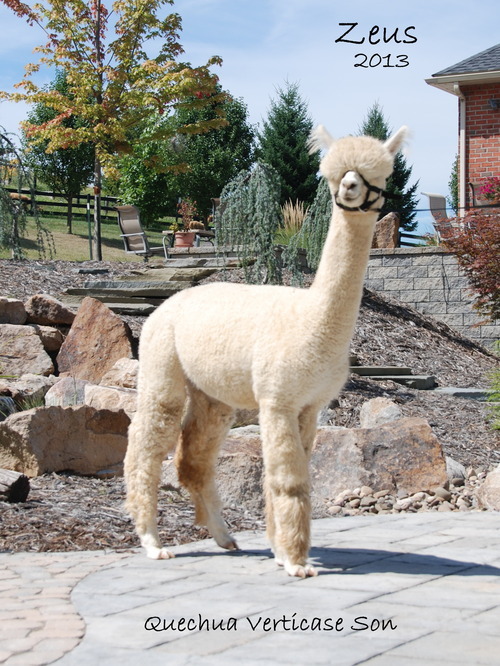 Alpacas of the Alleghenies is offering an Elite Snowmass Quechua Grandson! 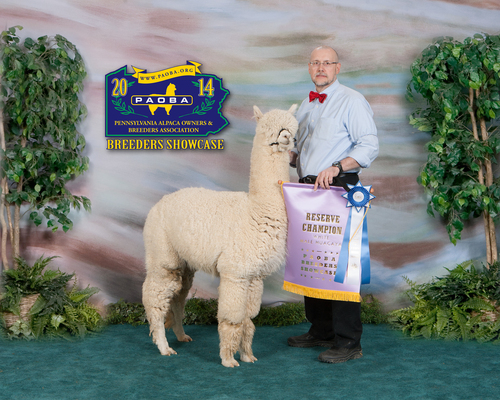 The name “Snowmass” is synonymous with outstanding elite quality alpacas. 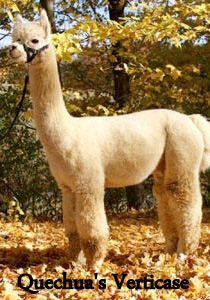 Snowmass Alpacas represents an accumulation of the world’s finest and most advanced breeding genetics. This is a great opportunity to add the Snowmass genetics to your breeding program through Alleghenies' Zeus. 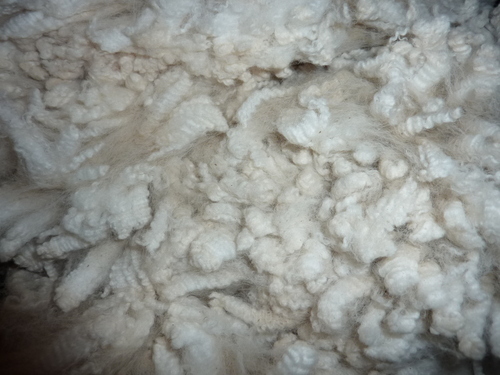 Zeus is the product of Quechua’s Verticase; his fleece is extremely fine and amazingly dense! Verticases' skin biopsy proves his density to be 110 follicles/sq.mm which is off the charts!!! Verticase was one of the most Elite Herdsires in our Industry today. Upon reviewing Zeus’ pedigree on the sire’s side, you will find the names of most of the top Herdsires in U.S. history…Peruvian Hemingway, PPeruvian Caligula, 6Peruvian Accoyo Elite, Snowmass Ccatanca, and PPeruvian Vengador. Verticase has passed his amazing characteristics on to Zeus. The density and structure is superb! Zeus has superior fleece characteristics and a laid back personality. With the passing of Verticase, this is a wonderful opportunity to own a Verticase Champion son, Zeus. We would like to reserve six breedings to Zeus. Give us a call to see this amazing male. 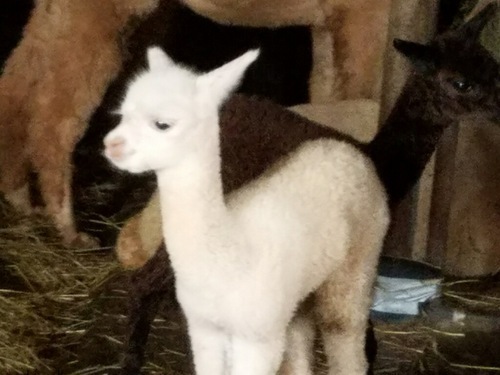 Zeus' cria has hit the ground and she is gorgeous! Beautifully proportioned, substance of bone, etc.